If your iPad Pro 10.5” screen is cracked or the LCD has missing pixels, is bleeding or has just plain packed up on you, Mountain Stream can repair your iPad quickly and get you up and running again. 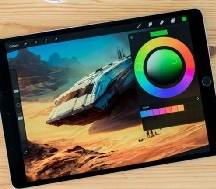 The iPad Pro 10.5” has a bonded screen, meaning the digitiser & LCD are glued together. The replacement screen assemblies are very expensive. As all other parts are under the fragile screen we do not offer any other repairs on this device, unless the repair includes broken screen replacement. Please see below for our fixed price for screen repairs. Prices are inclusive of parts and personal collection/re-delivery. For other iPad Pro 10.5” (2017) repairs please call, use our enquiry form or mail us at enquiries@mountainstreamltd.co.uk. Please check your iPad model nr before calling. The model nrs for iPad 10.5” (2017) are A1701 (WiFi) and A1709(4G). These can be found on the rear casing of your iPad.